Results from a five-site study using the QuantideX NGS RNA Lung Cancer Kit* published in The Journal of Molecular Diagnostics demonstrate the assay’s high sensitivity, accuracy, and reproducibility in detecting actionable RNA fusions and exon skipping events. The peer-reviewed article, titled “Design, Optimization, and Multisite Evaluation of a Targeted Next-Generation Sequencing Assay System for Chimeric RNAs from Gene Fusions and Exon-Skipping Events in Non–Small Cell Lung Cancer,” describes the design and development of the assay system. This system includes controls, pre-analytical sample QC, targeted RNA-based enrichment, library clean-up and pooling, and companion bioinformatics software that analyses the corresponding next-generation sequencing (NGS) data. Non-small cell lung cancer (NSCLC) accounts for more than 10% of all newly diagnosed cancers and is characterised by diverse molecular drivers ranging from point mutations and insertion-deletions to gene fusions and exon skipping events. NGS offers a multiplexed approach for detecting RNA chimera from many different fused genes and splice variants but it requires integrated reagents, controls, and interpretive software to standardise testing procedures and assure consistent results across laboratories. This study details the verification and external evaluations of the targeted RNA-seq panel across a total of >200 FFPE tumour biopsy materials representing common and rare RNA variants that are associated with NSCLC. The QuantideX RNA Lung Cancer Kit is a cGMP manufactured, end-to-end, NGS-in-a-Box™ product solution that simultaneously interrogates over 100 known clinically-relevant gene fusions, 3’/5’ imbalance markers to detect rare or novel fusions, MET exon 14 skipping events, and mRNA expression levels from 23 genes in NSCLC samples. The kit is part of an integrated workflow that delivers sequencing-ready libraries in approximately half the time of comparable competitor methods and incorporates push-button analytics to standardise test results. The assay is optimised for use with low-quality and quantity samples such as FFPE and fine-needle aspirations and can generate libraries from approximately 10-20 ng RNA or total nucleic acid. The targeted RNA-seq system was assessed for sensitivity, accuracy, alignment of results with alternative testing methods, and multi-laboratory concordance. Targeted fusions and exon skipping events were detected down to a 1% cell fraction in a wild-type background. Non-targeted fusions could be detected by 3’/5’ imbalance, with 100% of cases detected at 15% positivity and 50% at 5% positivity. Results of the Asuragen NGS assay were also compared to those generated by immunohistochemistry (IHC), fluorescent in situ hybridization (FISH), and/or the nCounter Vantage Lung Gene Fusion Panel (Nanostring Technologies) using residual clinical specimens. All results reported by the Asuragen assay were consistent with those generated by these alternative methods. Lastly, a five-site precision study was conducted to evaluate assay reproducibility. Every fusion and exon skipping event in the cohort of nearly 250 sample libraries was correctly detected across sites, consistent with the reference results. An accompanying commentary on the study, also pending publication in the journal, described the value of targeted RNA-based assays for limited nucleic acid inputs and for their focus on clinically actionable findings. VH Bio is proud to distribute Asuragen products to the UK market. 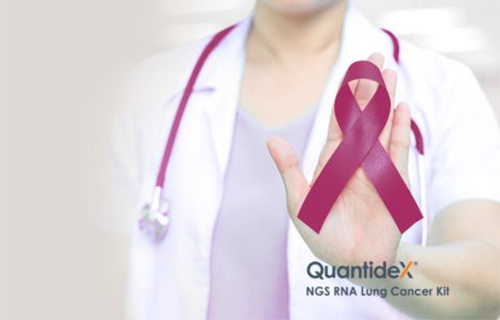 Learn more about the features and benefits of the QuantideX® NGS RNA Lung Cancer Kit or contact us with any questions about this product.